My transcript with added subheadings and hyperlinks follows the video. Copious subheadings will facilitate rapid skimming of a long transcript. Seven years ago I was standing in the Royal Courts of Justice in London. I’m a barrister. And it was the very last day of a long-running case where I had been representing a man who had been very badly injured and harmed in the workplace. And I was his lawyer. And I was giving voice on his behalf in court. There was a moment of silence while we waited for the judges to come into the room. And at that moment I looked out of the window and I got thinking. I looked out and I thought: You know the earth has also been badly injured and harmed. And something needs to be done about that. My next thought actually changed my life. I thought: The earth is in need of a good lawyer. Now that was a thought that didn’t leave me alone. And I went away and I thought about it. I thought well, you know, as a lawyer in court where are the tools that I need to represent the earth in court? And what I realized was that they didn’t exist. So I started thinking about this. What do I need to put in place for this? What if the earth had rights? After all, we as humans have rights. The most important right of all of course is our right to life. What if the earth had the right to life as well? And I spoke to other lawyers about this and they said, “Polly, you’re mad.” Of course the earth didn’t have rights. And after all there’s a whole body of environmental law out there, you know. Why not just use that? But I said, well there’s a problem here. All this existing environmental law, it’s not working. It can’t be working because we just have to look at the Amazon to see this is not working. We’re looking as mass damage and destruction that’s escalating every day. The existing law is not stopping that. So what I did, I looked around to see who else was thinking like me. And what I discovered was that in fact there are many people thinking like me: 750 million people out there to be exact: 250 million of them are indigenous. They get the idea that the earth has the right to life. They get the idea that life itself is sacred — not just human life, but all life. Also I discovered Buddhists understood this way of thinking as well. That’s another 380 million people: 750 million people the size of Europe already think like me. It’s just that it’s not written down in law. Then I got thinking further because of course actually with our human rights and our right to life that’s also governed on a one-to-one [basis] by the crime of murder (or in America it’s called homicide), when it’s ourselves and our community it’s called genocide. Another “Aha!” moment – Make damage and destruction to the earth a crime — the crime of ecocide. And I was actually speaking to a large audience a couple of years ago – back in 2009 – about earth’s rights when someone in the audience said: “You know we need a new language to deal with this mass damage and destruction that’s happening of the earth, of our ecosystems.” And I thought, you know, you’re right. It’s like genocide and ecocide. And it was one of those lightbulb moments. Literally I felt as if a light had gone on above my head. And I thought: My God, it should be a crime. Is that possible? Could we make ecocide a crime? And I rushed home and I went off and I researched this. A few months later I can up for a breath. And I realized that in fact, indeed, not only could we make it a crime but it is a missing 5th crime against peace. Now you’ll see here in this slide…what this sets out here are what are known as the international Crimes against Peace. We already have Crimes against Humanity, War crime, Genocide. They were put in place after World War 2. And they act as umbrella laws to cover the whole of the world. They’re kind of super laws, they supersede everything else. All other laws must come in line with them. Crime of Aggression, that’s the run up to war. That was just put in place in 2010. And I say that actually there’s a 5th crime against peace here, and that is Ecocide. What we have in existence already are laws that protect the wellbeing of life. Actually what they protect is the sacredness of life itself. And I’m saying it’s not just human life but we expand our cycle of concern out and that it’s the wellbeing of all life, of all inhabitants who live on this earth. This is a diagram of what’s happening in the world at the moment. We have damage and destruction on a mass scale playing out, which is what I call ecocide. And I’ll unpackage that term in a moment. But it’s leading to amongst other things resource depletion, which leads to amongst other things conflict, which can then lead to war, which of course leads to more damage and destruction, more resource depletion. 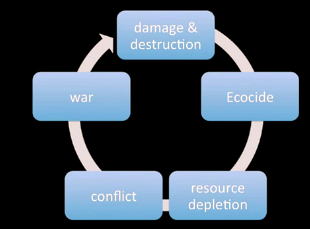 In fact, what’s happening in the Congo at the moment is a very potent example of this cycle spiralling onwards and upwards faster and faster: conflict leading to more war, more damage and destruction to more ecocide. And so it goes on spiralling onwards and upwards. It’s what Sir David King calls a century of resource wars. That’s what we’re looking at. Well, in fact, I think there’s another way that we can turn this around. We can actually halt it in its tracks. This is now about slowing down this cycle. But it’s actually about stopping it, intervening, and by creating law that actually acts as a disruptor to that spiral as it spirals onwards and upwards. And that’s what law of ecocide can do. Ecocide: The extensive destruction, damage to or loss of ecosystem(s) of a given territory, whether by human agency or by other causes, to such an extent that peaceful enjoyment by the inhabitants of that territory has been severely diminished. Ecocide is a crime when we cause extensive destruction and damage to a lot of ecosystems. Now every word here is legally weighted. But possibly the most important word here is that word “inhabitants.” You’ll see it’s not just people, but we’re talking about inhabitants. And of course that’s recognition that if we look at any given territory, it’s not just human beings that live there but there are other species as well. It’s also a recognition of the interconnectedness of life itself, ultimately destroy the earth that we stand on and we destroy our ability to live in peaceful enjoyment. Now there are two types of ecocide here. Human-caused ecocide is when we see and we’re able to ascertain as a result of our actions we are causing mass damage and destruction. And, in fact, we heard earlier today about how, in human-caused terms, we’re also creating injury in other ways – increasing of greenhouse gases. That’s one outcome of causing mass damage and destruction. I have, in fact, just recently submitted to all governments a concept paper on how we can use this law to close the door to dangerous industrial activity that is causing human-caused ecocide. But there is another type of ecocide that I wish to talk to you about today. And that is naturally-occurring ecocide. That’s when we see tsunamis, floods, rising sea levels – anything that causes mass ecosystem collapse. And we can create an international law that doesn’t just govern corporate activity, but more importantly that imposes a legal duty of care on all nations to give assistance when something like this occurs: because at the moment we have the likes of the Maldives standing up and saying, “Help us, we’re looking at going under water with rising sea levels within the next decades.” And governments are saying, “Nothing we can do.” And, in effect, what they’re saying is we don’t have a legal duty of care to give assistance. By creating a law of ecocide we can impose a legal duty of care so that all nations come together and pre-empt this. After all, there are 54 small island states that are looking at rising sea levels. And not just 54 small island states but other countries as well. Bangladesh is looking at not just floods, rising sea levels, but also they have a triple whammy because they have melting ice as well. By imposing a legal duty of care on nations, the dialog can begin to take place where we decide what we are going to do to give help. And that is very important – that we can move forward together in this — because ultimately at the end of the day, even if they are on the other side of the world, we are in this together. But it goes further than that. In international criminal law, we have a principle called “Superior Responsibility”. Yes, this is about taking responsibility, but more than that, it’s about imposing superior responsibility upon those who — if you imagine like a triangle, sit at the top of the triangle, those in a position of command and control – now that means heads of state, ministers. 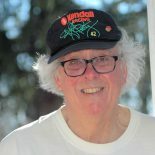 It also means chief executives, directors, heads of banks – those who are in a position to make decisions that can adversely impact on many million peoples underneath, and by imposing legal duty of care upon those individuals we actually create a framework upon which we can make decisions that are based on prioritizing people and planet first. And that’s about closing the door to the dangerous industrial activity. What this comes down to is two different ways of viewing the earth. View the earth as an inert thing and what we do is we put a price tag on it. We impose a value on it. What we do is we buy it, we sell it, we use it, we abuse it. We commoditize it. That’s all governed by the law of property. However, there is another way of viewing the earth. And that’s about viewing the earth as a living being. And when we do that it comes from a very different place. In fact, it shifts dramatically how we look into the long term. Because once we see ourselves as trustees, as guardians, we start taking responsibility for future generations. And this is about realigning the scales of justice. Just now they’re out of kilter, they’re out of balance. And I believe we can do that, we can rebalance that. In fact, we have done this once before in history. And I’d like to take you back 200 years. Two hundred years ago William Wilberforce — who was the parliamentarian here in Britain who took up the mantle for abolition of slavery – when he stood up and said morally slavery is wrong. We must stop this. What he met with was a barrage of objections. Big industry said you can’t do that because it’s a necessity. The public demand it. And what’s more our economies will collapse if we get rid of slavery. Well those 300 companies that were involved in slavery they came up with different ideas. They said leave it to us to sort out. Voluntary mechanisms: we will self-regulate this. Too many laws already. What’s more, we’ll limit the numbers, if push comes to shove. In fact, we can leave it to market forces to work this out: create a “cap and trade” system, if you like. Now the interesting thing is that the British Parliament said no to all those proposals. And indeed two days before William Wilberforce died laws were passed which created ripples right across the world in ending slavery. Now if we look to today what we’re seeing is actually a very similar picture. What’s changed here in the picture? This is of the Athabasca tar sands in Canada. Now when I first saw these pictures my heart stopped. They stopped me in my tracks. I looked at what was going on there and I said really this is a crime. Now what we’re seeing today is that industry is saying exactly the same thing. The difference is that, in fact, we have tried the solutions and we have discovered that they don’t work. Now one of the successes that came out of slavery was the fact that it was managed, there was a transition period. Not one of those companies went out of business. And William Wilberforce was governed by something that I’m also very governed by. This is not about closing down big industry. This is about making the problem into the solution. In fact, not one of those 300 companies went out of business after the abolition of slavery. Some of them went on to trade in tea in China. They were given subsidies. Some of them actually became the police of the seas. Because William Wilberforce said three crucial things have to happen: you pull the subsidies, you outlaw the problem, and you create new subsidies in the other direction. And that’s precisely what we’re needing to do today. But it’s more than that. It actually goes back in the annals of time, of something that’s known as the Sacred Trust of Civilization. Now this is a concept that goes back in written documents as far as I could find to the 16th century. And it’s been enshrined in the United Nations’ charter [Chapter XI, Article 73], which is our first successful international legal document put in place after World War 2. And what that says is that members of the United Nations have a duty, a legal duty to put the interests of the inhabitants — that word again, “inhabitants” – as number one. The primary duty that we have – the duty of care – and that we accept as a sacred trust. Trust. So this is about our being trustees, stewards, guardians. And that we have an obligation to promote to the utmost the wellbeing of the inhabitants. The health and wellbeing provision; it’s about putting people and planet first. A law of ecocide gives this section in the United Nations’ charter legal validity. And that’s very important. Because an international law of ecocide is a crime against humanity. But it’s more than that. It’s a crime against nature. It’s a crime against future generations. Ultimately, most importantly, it’s a crime against peace. This is about prioritizing people and planet over and above profit. But also a recognition that when we do that, when we open the door to a conflict-free world we can create innovation in a very different direction that actually gives us abundance in many, many ways. Now I’m not anti-profit – not at all. In fact, I’m very pro it. But what I am is I’m closing the door to that which causes life destruction. And I’m opening the door to that which affirms life itself. So this takes me back to seven years ago when I started with one very powerful thought, and how it’s really led me on a journey. And it continues to do so. It’s not just about proposing an international law of ecocide. But in fact it’s also beginning to lead me along a journey of examining what is it that we need here – leadership, an adaptive leadership. We have fast-changing times. Did you know it’s the law for corporations to put profit first? It’s also led to a book, Eradicating ecocide that sets out this law and explains why law, in fact, has caused the problem. Did you know this? It is the law for corporations to put profit first. A company has a legal duty to maximize its profits to its shareholders. Now that used to serve us well. But unfortunately we didn’t look to the consequences. A law of ecocide would supersede this and impose a piece of legislation that in fact allows us to look to the consequences – a think-before-you-act provision that acts as a great turnkey. Now in conclusion, I just want to say this. Martin Luther King once said that when our laws align themselves to equality and justice then we will have true peace in this world. When our laws align themselves with a higher understanding then we will have that true quality and justice. Ecocide is a law that allows us to align ourselves with natural justice. And I believe that in my life that is something worthy of actually giving my life to, to make happen. ABOUT TEDx — In the spirit of ideas worth spreading, TEDx is a program of local, self-organized events that bring people together to share a TED-like experience. At a TEDx event, TEDTalks video and live speakers combine to spark deep discussion and connection in a small group. These local, self-organized events are branded TEDx, where x = independently organized TED event. The TED Conference provides general guidance for the TEDx program, but individual TEDx events are self-organized. This entry was posted on August 19, 2012 by fjwhite in counterpower of one, environmental activism, evidence based counterpower, leadership, legal counterpower, moral & ethical counterpower, rights and freedoms and tagged Crimes against Peace, ecocide, Polly Higgins, tar sands.